So I heard about this from one of the people who posted on my Riot Grrrls For Life Pro-Life facebook page when I first started it. She mentioned that Margaret Sanger was pro-life and she really liked her, and so at first I was shocked, as I had assumed that she was the queen of abortion, as that's what everyone, pro-lifers and pro-choicers alike, make it seem like, and what with her being the founder of the main voice for pro-choice, I guess I assumed it like everyone else does. So I start to look it up, not knowing what to expect, and it turns out, she was right. She hated abortion for several reasons and has a lot of good pro-life quotes. I found this link talking about how that one infanticide quote was totally taken out of context, and what she really said about abortion and infanticide, and how she often linked abortion, infanticide, and child abandonment together, calling them all "horrors" and the like, and other things like that, and this link that said the same stuff and gave more quotes. You can actually go to her book Woman and the New Race from there as it links it, or hey I'll just give it to you here, and it is written all over how much she hates abortion and infanticide and other things like that. Also, you can look at her wikipedia page. Some pro-choicers will try to brush it off like it doesn't matter or she was only against abortion because of how dangerous it is to pregnant women, but she clearly has said at least a few times that it was because it was the taking of a life, so I'm sure it was for both reasons. In fact, Planned Parenthood pamphlets used to advocate against abortion, saying "An abortion kills the life of a baby after it has begun. It is dangerous to your life and health. It may make you sterile so that if you want a child you cannot have it. Birth control merely postpones the beginning of life." I guess the phrase "every child a wanted child" was first only meant in reference to birth control as well, since it says that on there too. Here are links I found for that. I'm not saying she was a good person, and I'm not saying she wasn't racist or for eugenics (though honestly I don't know), but I am saying that everything like that she was for, was only with wanting to prevent them before conception so that no one was killing any human beings. She worked to secure birth control in part to get rid of abortions and infanticide. She knew that it was the taking of a life, so she wanted to take care of the situation before that happened. She seems like one of those people who is both good and bad. Some things about them you love, and others you hate. It did at least give me more respect for her, because in researching this, I found that I liked a lot of what she wrote. They added abortion to Planned Parenthood after her death, and I'm sure that's why everyone assumes it, and no one corrects people. I'm sure if more people knew their founder worked to get rid of abortion, less people would support PP, or there would be some sort of outrage, and so they probably keep it under wraps. Also, the more conservative and religious pro-lifers really like to paint her as the queen of abortion and infanticide, and I have even posted that she was pro-life on a few pro-life pages, and they argued with me and tried to act like it wasn't true, and one even blocked me, even though I didn't do anything other than simply state that and post those links. So, funny enough the pro-life side is also fueling this false info, when really they could be using the fact that she was pro-life to say it's disrespectful that Planned Parenthood have abortion services. Or like that first link from the livelydust blog states, "And anyway, why would pro-lifers want to base a campaign against abortion on misinformation? Why not just sweetly point out that Planned Parenthood's founder called abortion a horror and devoted her life to making it unnecessary?" We really should be doing that. Why bother to keep pushing a lie just because it makes someone look like they support abortion, when the people who support her already do, when you could be telling the truth and saying that even the woman pro-choicers love and celebrate as the leader of women owning their bodies and reproductive rights, was against this? "Although abortion may be resorted to in order to save the life of the mother, the practice of it merely for limitation of offspring is dangerous and vicious. 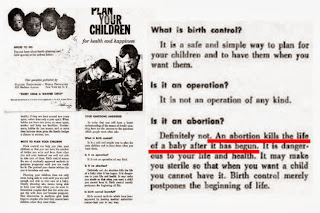 I bring up the subject here only because some ill-informed persons have the notion that when we speak of birth control we include abortion as a method. We certainly do not. Abortion destroys the already fertilized ovum or the embryo; contraception, as I have carefully explained, prevents the fertilizing of the ovum by keeping the male cells away. Thus it prevents the beginning of life." "To each group we explained simply what contraception was; that abortion was the wrong way—no matter how early it was performed it was taking life; that contraception was the better way, the safer way—it took a little time, a little trouble, but was well worth while in the long run, because life had not begun." "Human society must protect its children–yes, but prenatal care is most essential! The child-to-be, as yet not called into being, has rights no less imperative." "While there are cases where even the law recognizes an abortion as justifiable if recommended by a physician, I assert that the hundreds of thousands of abortions performed in America each year are a disgrace to civilization." ""It is apparent that nothing short of contraceptives can put an end to the horrors of abortion and infanticide"
"[It is] the most barbaric method [of family planning], the killing of babies — infanticide — abortion." "Usually this desire [for family limitation] has been laid to economic pressure... It has asserted itself among the rich and among the poor, among the intelligent and the unintelligent. It has been manifested in such horrors as infanticide, child abandonment and abortion." "When motherhood becomes the fruit of a deep yearning, not the result of ignorance or accident, its children will become the foundation of a new race. There will be no killing of babies in the womb by abortion, nor through neglect in foundling homes, nor will there be infanticide." 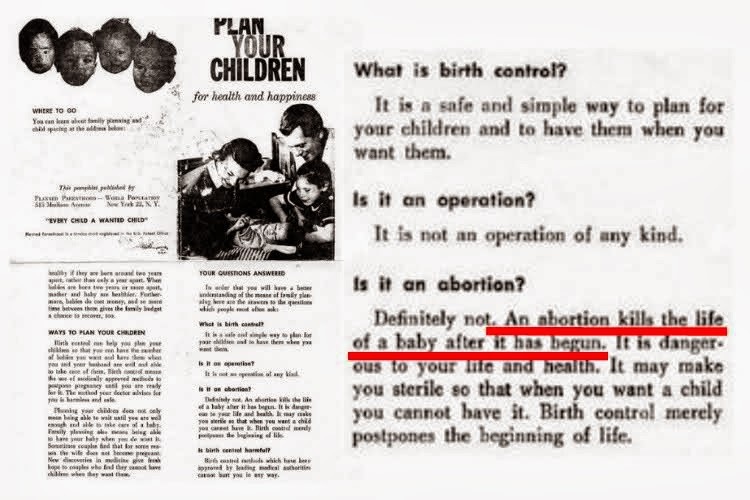 It makes sense that Margaret Sanger was pro-life as all the feminists of the time were. "Stopes was strongly against the termination of a pregnancy once it had started: her clinics did not offer abortions during her life. She saw birth control as the only way families should limit their size. The nurses at her clinic had to sign a declaration in which they swore not to "impart any information or lend any assistance whatsoever to any person calculated to lead to the destruction in uteroof the products of conception." When she learned that one of Avro Manhattan's woman friends had had an abortion, Stopes accused him of "murdering" the unborn child. "‘I was glad you gave space to the fact that the Queensland Medical Association is planning an extensive educational campaign against the evil of abortion.’ – Marie Stopes. (When Stopes found out that her contemporary Avro Manhattan had pressured one of his lovers into having an abortion, she called him a murderer to his face. And when William Carpenter named his abortion shop after her, she took legal action against him. But today, the largest abortion business in the UK bears her name since it was founded in 1976, eighteen years after her death.)" Absolutely fantastic blog! I was so shocked to read she was pro-life. I hope the word gets out.